Create a C++ subclass of APawn. Subclass of APawn must have either USphereComponent or UBoxComponent, and USkeletalMeshComponent. Add all necessary functions and use FObjectInitializer to CreateDefaultSubobject for each components. Create a blueprint that derives from this C++ subclass. That's how I got the components to be inherited. Make sure blueprint has skeletal mesh component. Make sure blueprint collision component. Make sure blueprint collision component is root component. Make sure the blueprint skeletal mesh component is child of root component. Create an animating skeletal mesh component. Check to make sure the skeletal mesh component in the blueprint is animating. If yes, select the root component. In my case, I selected BoxCollision (image top left). In the Details pane on the very right, it should be completely empty. In the Details pane, click on top right corner, "Open Selection in Property Matrix". 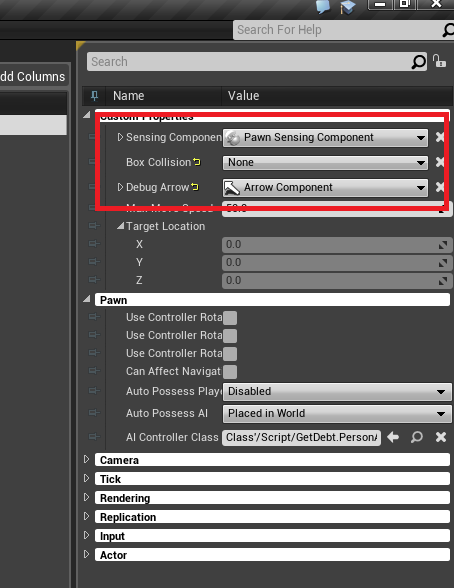 This will make BoxCollision properties appear in the Details pane. Go back to the Blueprint. At the top left, click on the BoxCollision (inherited). On your right, expand the Box Collision properties. Tick Absolute Location to ENABLED. Play around the Relative Scale 3D. 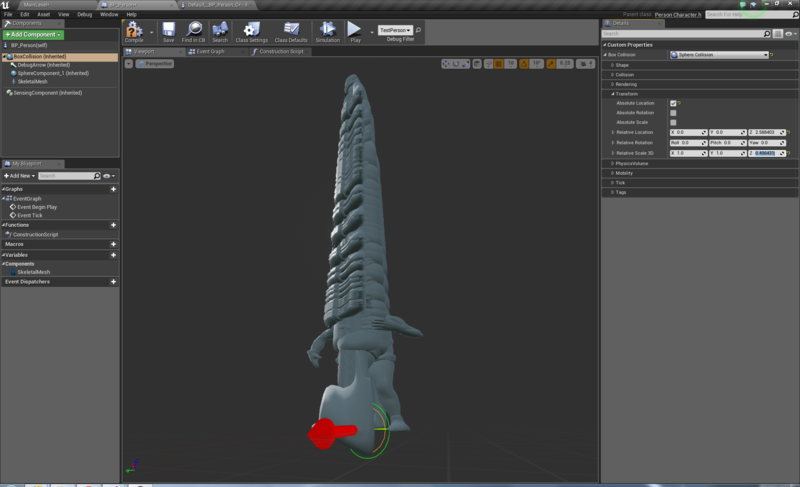 I chose to use the Z axis. Also, in order for us to replicate your exact issue, could you please provide us with the code class that sets up your pawn? It'll be the subclass of APawn. I can't seem to upload an attachment to Answerhub. Thank you Asperatology for providing us with the code classes you used. I have uploaded those files to our bug report for the developers to look at more closely. I will update you as soon as I hear back regarding this issue. You're more than welcome to contact us as well, if you ever have a question on the status. graphics glitch in editor any ideas on a fix?